This houseboat is comfortable place with all you will need - no amenity lost. Full kitchen, living space with sleeper sofa and table, bathroom with hot shower and functioning toilet, wall heaters for cozy nights, 2 double size beds, and a double sleeper sofa. Comfortably accommodates 6 people. As for living on a boat, there is little like it, and I suggest you try it out. You might be looking at some shwanky pad as well, and that would be great, but this is a cool experience, a piece of Seattle history you should wear for a few days when you can. It's an opportunity to be around the mayhem that is water life during the day, and the peace and tranquility that floating can be at night. - 3 kayaks - first come, first serve. No reservations available. - The ceiling height is not standard, max 7', plus there are a few smaller accesses to different parts of the house. If you are very tall, you may find this irritating. The stairs to the 2nd floor are steep and narrow as well. If you have physical difficulties, this may not be the best match. - On occasion the toilet holding tank does get filled and it unable to be pumped on weekends. There are bathrooms at the marina for use, which I encourage. I will not offer any refunds if the holding tank does fill and is unable to be pumped. Of course, we will do our best, but there are limitations. •	Please do not wander the docks and pear or peak into other boats. •	Guests - Only 2 guests are permitted on Rutabaga Houseboat during the day time, beyond the 6 maximum registered guests. •	Pets - Pets are not allowed. No social gatherings are allowed. Any gatherings will disturb neighbors and violate marina rules. If guest is found to be hosting any type of social gathering, eviction will occur, and a charge equal to the amount of the security deposit will be applied. No smoking is allowed in the houseboat or marina area. You may smoke outside in the marina parking lot, at least 20 feet away from open windows or doors. Please dispose of cigarette butts in trash cans. Please take off your shoes when entering. Normal wear and tear on the floor surfaces is expected, but if there is excessive dirt, stains or spills you will be charged additional cleaning and/or repair fees. Inappropriate behavior such as loud and/or vulgar language and/or drunkenness is strictly prohibited. If guest is found to be engaging in inappropriate behavior eviction will occur, and a charge equal to the amount of the security deposit will be applied. Security deposit and remaining room and tax will also be forfeited. Turn off lights, television and heaters when not in use. Do not intentionally destroy, deface, impair or remove any part of the property, equipment, furniture or furnishings. Compensation will be sought for damaged or missing items. All homes, houseboats, and boats in the marina are private property. Please stay on walking paths, paved roads and roadsides. All garbage is to be bagged and placed in the outside garbage bin behind the marina office. Please limit to one bag of garbage per day. Any garbage exceeding this amount must be disposed of elsewhere. The property will be cleaned after departure. Tenant is responsible for any additional housekeeping charges due to carelessness, obscene conditions, failure to return furniture in original position, not following check- out instructions and/or pets. Additional Housekeeping Fee – as required; minimum $150. Pets - Pets are not allowed on Rutabaga Houseboat. If guest is found to have violated this room, immediate eviction will occur. A charge equal to the amount of the security deposit will be applied. NO EXCEPTIONS. DO NOT use any products other than water and soap to remove a stain because certain products will stain the carpets. No refunds will be given due to inclement weather or malfunctions in equipment (heaters, electricity shut off, water shut off, stove, WiFi). 1. Respect the privacy of all other tenants on the Marina. No one is allowed to wander the docks. 2. Alcohol may only be consumed on the vessel. There is to be no alcohol on the docks. 3. Noise complaints from any source may result in immediate termination of your stay. 4. Put absolutely nothing into the lake. No garbage. No food. No liquids. 5. Smoking is not permitted in the marina. 6. Fires and fireworks are not permitted in the marina. 7. All garbage is to be bagged and placed in the outside garbage bin behind the marina office. 8. Bathroom and garbage facilities are available at the marina. Should guests damage any portion of these premises, guest will be held financially liable for all repairs. 9. No signs may be posted on any property or lot. 10. Any violation of applicable laws may result in immediate termination of your stay. Any violation of applicable laws may result in immediate termination of your stay. Please be aware that each violation of any of these rules, or other rules outlined elsewhere, will result in a minimum fine of $200 per incident. Enjoyed sitting on the back deck and watching Seattle life go by. Rowing teams, sailboats and water planes landing and taking off. A great addition to our trip. Jicama is a great boat in an awesome area and dock. We had a blast. We were 2 best friends and the size was perfect for us. More than 2 might feel like a crowd, depends on what you are used to. This is a really great boat that is really easy to maintain. We refilled the water tank and had an electricity outage, all of which our host quickly and easily walked us through. Success! I would def return, but if I could “fix” anything, I would do a few updates. It is a clean boat. But it could be super nice with a little elbow grease. A magic sponge to walls and non usually “touched” areas could use a good cleaning. Smudges and scuffs, broken laminate on the counters, loose base boards, etc could use some tlc. Again, nothing bad and our experience and host were top notch! Just a simple couple of suggestions :) excited to come back! Even in a wind storm! We had a fantastic stay on the Jicama Houseboat. It was a great location-beautiful views. Marina was quiet and everyone was very pleasant. The house was so fun-I would recommend to anyone. This was an awesome place to stay in Seattle for my family of four. We loved the location, and the houseboat itself was super cool. We loved to kayak, fish off the dock, grill on the deck, and just chill. It was a great combination of outdoor relaxation with urban proximity. Having said all that, here's what keeps this from being 5-star: cleanliness was passable but not hotel quality; no washcloths (a pet peeve of mine with VRBO properties); and the bed loft area had no window coverings. Now, the open windows in the sleeping area provided an incredible view and wonderful fresh air flow, but you'd better be an early riser in the summer, because at 6:00 am the sun was blasting me in the eyes. There are window coverings that would keep the open benefits while mitigating the drawbacks. 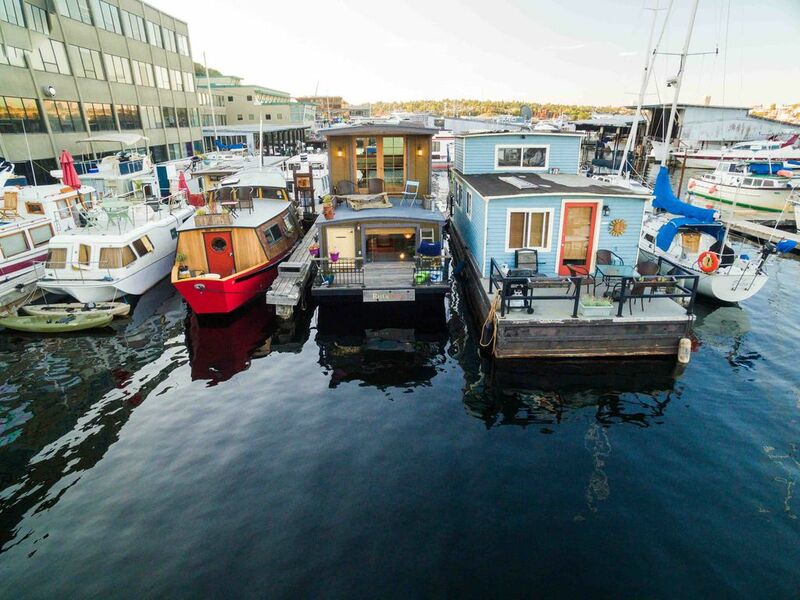 All in all, with your own washcloths and sleep masks packed, this sweet houseboat is a fantastic place to stay in Seattle. Fun little place to stay! Museum of History and Industry close by- it is a gem! We had a great time staying on this houseboat even though only for one night. Would have liked to stay a little longer.